To be notified immediately of any news on Marquee HD mods , click HERE (you must be registered and logged in to the forum). Sign up for our newsletter too. We are proud to offer these special Marquee HD mods for you to bring your Marquee CRT projector (or clone) back up to spec and offer even greater performance! 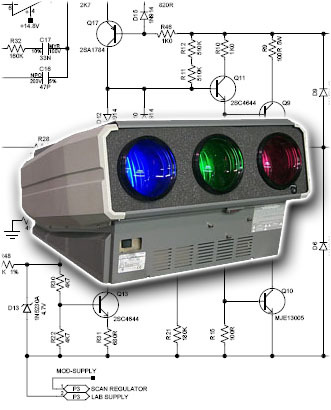 These upgrades are offered for the Marquee series of CRT projectors and clones. These machines are 10-14+ years old now so some preventative maintenance will insure continued reliable operation. If your machine is an un-touched (unmodified) original you will also see a performance increase from this upgrade: 10-20% resolution increase for Blu-ray, better colours, and less smearing/streaking. This is a CurtPalme.com recommended and approved service. Which projectors are included with this service? There is approximately 10 hours of labour involved. It is slow, precision work requiring extensive before and after testing. What improvements will the Marquee HD mods offer? If your trusty Marquee is drifting a little bit and requires regular touch-ups (even after warm-up), then it's likely there's some tired parts on that 10+ year old projector. An improperly running projector will have more problems over the long run. Just like changing your oil, certain parts should be replaced in your Marquee projector to ensure a long, trouble free life span. On our test bench we've now seen many times now how a stock machine has very poor spot-size capability: Test pattern grid lines are simply too fat. After the modifications the focusing and spot size are much better. We would go as far as to say that an original 10+ year old Marquee fed a native Blu-Ray HD signal is losing at least 10-20% of the picture quality and resolution without these Marquee HD mods. Below are pictures of some of the boards that are modified. Not all boards are shown. How long does it take to have my boards modified? Typical turn around after the boards are received is usually 1 week assuming multiple orders aren't all received at the same time. There is approximately 10 hours of labour involved. It is slow, precision work requiring extensive before and after testing. Contact DraganM at draganm@curtpalme.com with any questions. Do the boards have to be in working condition? 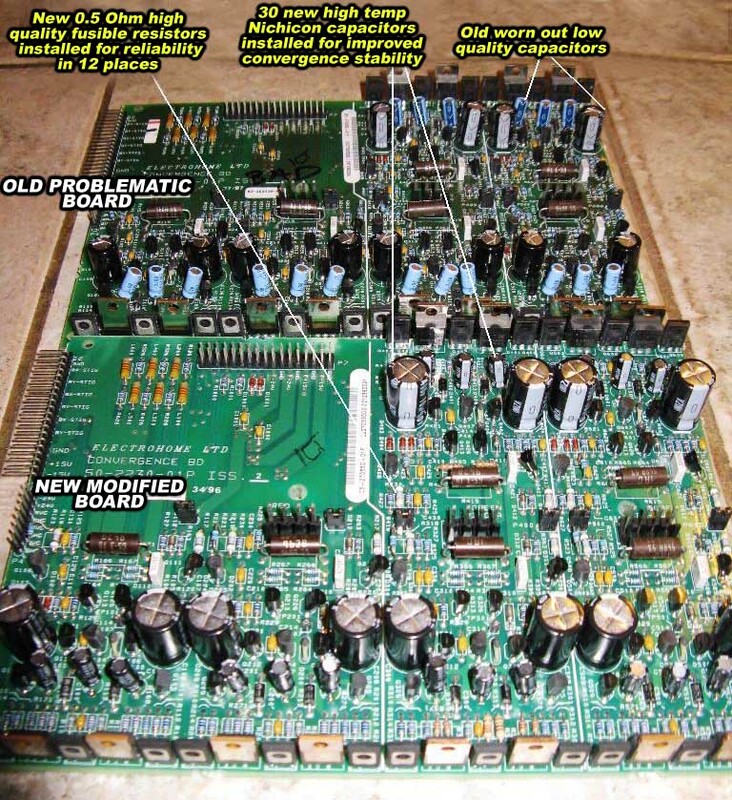 Do you fix boards? All boards must be in working condition. This is not a repair service. The boards will be tested both before and after the modifications. If your boards are defective (your projector does not power up) you will need to contact Curt Palme at curt@curtpalme.com first to have the boards repaired. Curt can repair your boards. Note that he does not offer this Marquee HD mods service. How do I remove and package my boards for mailing? 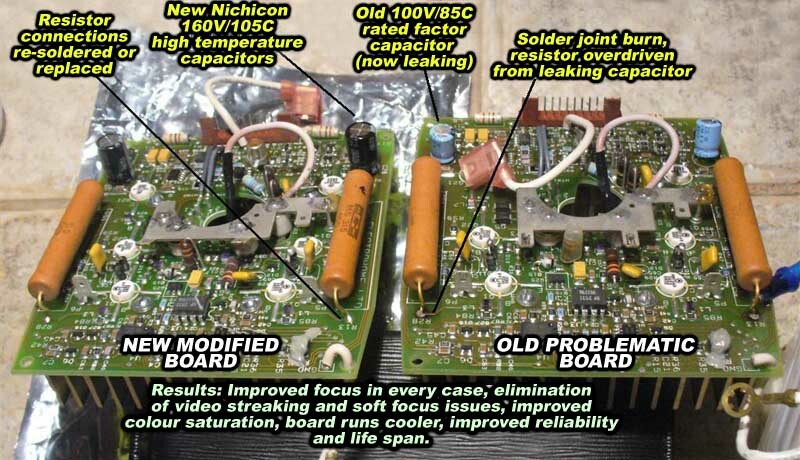 These modifications requires some very basic ability to follow instructions and remove/replace your old boards. See this document for detailed instructions with pictures: Marque Board Removal (440Kb PDF file). How do I know if I need this done to my Marquee? Generally speaking, after 10 years (check the date on the sticker next to the power cord) they all need it but here's a simple test: On a 16:9 widescreen projection turn on your video source at 1080i or 720p for a Marquee 8110/8500 or 1080p for a Marquee 9500. Now pull up the jail-bar (pluge) video test pattern by pushing the # button a few times on the remote. Look at the squares in the center of the screen. If your set-up is done well you should clearly see scan lines at both 1080i and 720p on an 8110/8500 and at 1080p on a 9500. If not, then your machine is probably running out of spec and will benefit greatly from the modifications. I already have the Mike Parker video chain upgrade done, do I still need this modification done? YES, even more so than a stock machine. A hot-rodded video chain is only good as the deflection and focus circuitry it relies on to control the electron beam and "paint" the raster on the tube face. By upgrading the video chain and ignoring the rest the machine (weakest link), you place even more strain on an already tired projector. Note: If you have the MP mods then I do NOT need the 3 neck-boards and you will be refunded $50 after payment and you do not need to send in your 3 neck-boards. My projector has problems currently, every once in a while it shuts down. Will this service fix my machine? No. This type of problem is usually caused by a fault in the low or high voltage power supplies, or possibly by a leaking high voltage wire. If you hear an occasional SNAP inside your projector and the set shuts down you need to repair this ASAP. Contact DraganM at draganm@curtpalme.com for instructions and do NOT run the machine in this condition. My marquee has very high hours on it. Are the mods worth it? Are they any other mods that need to be done? The service listed above is most definitely needed for high hour machines. In addition, if you have over 15,000 hours on your machine you may benefit from some modifications to your Control Module (CLM) as well. Contact DraganM at draganm@curtpalme.com for more information and pricing. If you have a high hour machine that is unable to maintain sync at higher frequencies (ie: you are able to display 480p but are unable to display 720p or higher for any length of time) then this extra service is for you. When purchasing you will be paying and dealing directly with the third party seller 'DraganM'. While this service is not sold or supported directly by CurtPalme.com, we are in the service business and our only goal is your complete satisfaction. We work with our vendors to ensure you are completely satisfied. A thumbsup from Mike Parker (one of the early creators of Marquee performance mods) is always a good thing! Great price. Nice job picturing everything that'll be done. 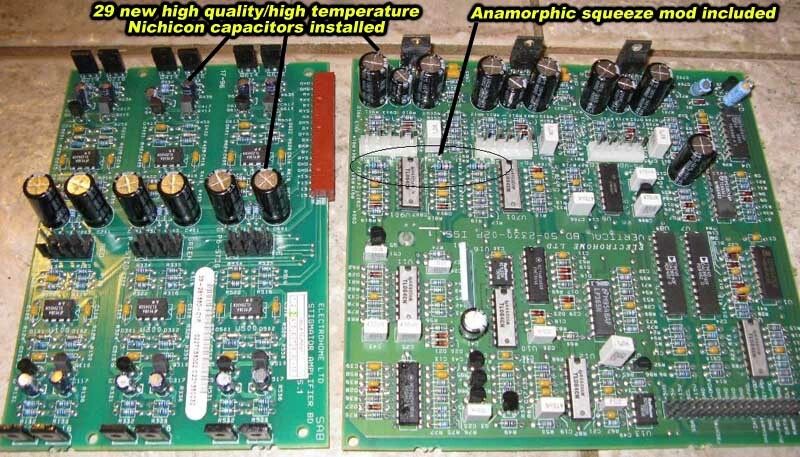 Typo ["capactors" (sic)] in the "Stigmator Amp and Vertical Deflection boards" picture. Yep. Some people will still find it expensive but you have to realize there's over 10 hours of labour here, plus parts and other expenses. Works out to about $35/hr labour rate. Try getting any professional level service (plumber/electrician/etc) for that rate! 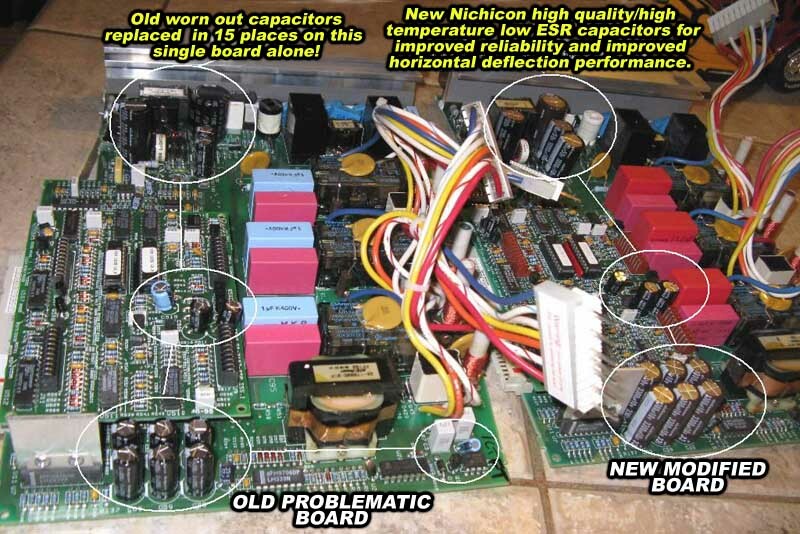 Typo ["capactors" (sic)] in the "Stigmator Amp and Vertical Deflection boards" picture. Hey, when you use quality caps like the Nichicon, there's no need for an 'i' in capactor. Glad to see you went forward with this Dragan. Hope it goes well for you. And these mods do wonders for the longevity and stability of your beloved Marquee. And Dragan's work will be top nothch!!! I added a link to the Marquee thread !!! Damn, Draganm told me on Saturday that this would be coming, but I didn't expect to see it this fast. Bravo! thanks guys for the thumbs up. this will be interesting to see the results people get and I will ask a couple of folks to post their own before/after impressions. This is the frist one from Steven in CA. stock Marquee 9500LC (no MP mod's) with 5K hours on the chassis/tubes. Hi Dragan, I received them on Friday and installed them back right away. I had to do the convergence, so I have reset the convergence. Did the source setup again, and did focus, stigmator, etc. The picture looks very good. Contrast is much better and 1080P black looks close to when I set it up at 960 x 1440. No more black tinted with slight gray tone. I don't know why but I think color saturation has also improved. Now I see excellent color depth and tone. I also think the resolution has increased a lot when watching movies, though I can't verify it on my computer screen (I am using an HTPC). Part of the reason I am not getting maximum resolution could be that I am using 110" wide screen with HD10L lens. Corner focus is slightly off though I don't notice it when I watch bluray movies. Slight green spilling to the bottom of the screen is not fixed. I think the problem may be in the tube. Thanks for your excellent work! I think it's worth every penny and I recommend it to any marquee owner. this machine might have an issue with fungus in the green tube, not sure yet but all the results are pretty mcuh what I would expect video performance wise. they are indeed nice caps, it's cool to be able to add 2009 electronic's technology to a 10 to 14 year old machine. I'm pretty sure the spec's on the Nichi HE series caps weren't even possible back then. Glad to see you went forward with this Dragan. Hope it goes well for you. And these mods do wonders for the longevity and stability of your beloved Marquee. And Dragan's work will be top notch!!! that thread was the final inspiration to do this Athan so thanks for that. I also owe credit to MP for starting the original Marquee maintenance thread and also for the encouragement to do this, Tim Martin at E-tech for his help over the years and finally Curt for hosting this. It's also gratifying to pitch in a little support to the forum and web-site which is the last Bastion of CRT as a Home theater hobby. oh one more important thing to mention and that's return shipping. All boxed up with rear heat sink, HDM, FCM and 3 x VNB it's 21 pounds. it's pretty cheap for the lower 48 but Alaska , Hawaii , Canada is 60 bucks, EU is $100. , and Australia /New Zealand is $140. I know it's a bummer but I looked all over and those were the best rates I could find with US postal service. MP: Is it Ok to send your modified neck boards for this "upgrade"? D: Is it even necessary to send MP modified neck boards as a part of this upgrade? There's really no need to send neck boards or VIM for this. That part has already been taking care of.. So you'll save $50 and you don't need to send in your 3 neckboards. Great! I get to be the first customer to write a review for these Mods by DraganM. I am also one of Dragan's first customers back in 2003. Back in the "day" Dragan came across a supply of Electrohome projectors and I was able to cherry pick my projector with 39,000 hours but mint tubes. A healthy Marquee 8500 projector. Obviously, the previous owner (company) replaced these tubes before selling off their entire inventory. After the initial squeeze and power supply mods Ive been running this project at 960P on my home theater computer running TheaterTek for years without issue. Bright, vivid and pretty picture on a 94" gatorfoam board screen. Then Cox Cable HD and BluRay players came along. Well, it's been mentioned many times on the AVS forums that you simply cannot get 1080P on a Marquee 8500 but since the projector now has 44,000 hours and getting on in age, at least I can get it rebuilt and enjoy what the projector is capable of doing. I purchased Cox HD cable service and a Samsung 1400 Blu-Ray player and set both for 1080i. Stunningly beautiful picture. Along with a new Moome HD internal card with Gamma Correction this setup up blew away my old Home THeater computer in all ways I can think of. Clearer, brighter, vivid, 3D. I was really happy with my home theater but was a little frustrated that I paid for a 1080P BluRay player but was not able to enjoy 1080P. I believe this is one of the reasons why the projector fan base is fading in the last year. So, I called Dragan and we discussed doing these projector upgrades. I agree'd to have him upgrade every board in the projector. A short few weeks later I got all my boards back and put it all back together. First thing I did notice was his superb packaging. No doubt that when he ships something it will arrive safely. Definately saving this packaging to re-use someday. Examining the boards, I must say, really good solder work. Very clean and professional. It's amazing how many capicators and resistors he replaced. Glad I didn't have to do it. WOW, You know how you can't see anything can be better until you see it. This is definately the case here. Originally I didnt think my projected image could be bettered. These upgrades didn't just improve the image quality 20%, I would say it was 200 to 300%! It's a funny thing about percentages, 100% means its double the amount. Well, I have to say, being a subjective thing, my image quality is 3 to 4 times greater in clarity, resolution, and vividness. Now I can truely say my picture is 3D. It's like I got an entire new projector. Convergance is rock solid, test patterns are razor sharp. Spot size is exact. Scan lines are easily seen. Before, I could not see scan lines at 1080i easily. Dragan from the beginning advised me that something was wrong. The boards were getting old and I should be able to see scan lines easily at 1080i. After the upgrades, not only was scan lines at 1080i are easily seen but also at 960p. But that is not the biggest news. My projector does 1080P !!!! No, I do not see scan lines very easily at 1080P. They are there, but hard to see. But! Doing an A/B back and forth between 1080i and 1080P on my Blu-Ray player is an amazing differance. The picture is so much more sharper. Now we are strickly watching all movies in 1080P. Now of course, when we have guests over to watch a movie they are properly amazed. Even those snooty un-educated 1080P LCD owners are impressed. Where before they only focused on picture sharpness and turn their noses up at the "softer" image of a crt projector. I can't say enough how happy I am with these upgrades. Highly recommended. Here is a link to my project website. 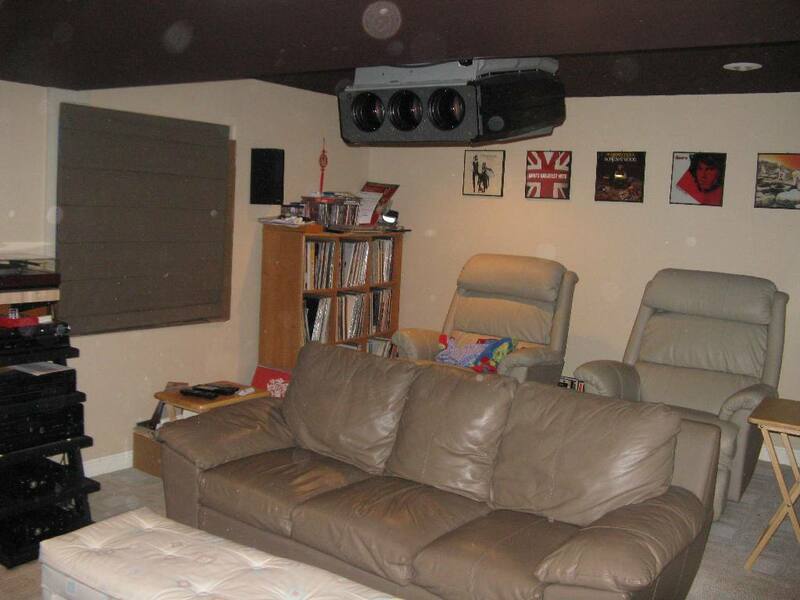 Pics of the earlier stages of my home theater. Nice Write up StylinLp and an exact and perfect description of what these mods and the Marquee can do. Dragan, keep up the good work!!!! Stylin's a friend of mine and as such was a Beta tester early on when I put it all together. Still you can see by his equipment he's pretty picky about his gear and the performance he gets from it. Being a high hour machine I knew he would see the improvement by leaps and bounds and it proved to be true. I'm pretty sure he will get another 47,000 hours out of that machine now and probably more. I didn't want to brag but since you brought it up, I built the TT too. I called it the Obsidian and it's based on something called a Teres design. IT was all custom designed and machined except for the Toneram and motor/pod which were purchased. Dragan - Any idea on postage costs to Australia for 2 projector sets minus the neck boards? I'd want something with tracking. You'll not need to send the VIM either. I'm sure I've mentioned that before. The caps on the Marquee mods going back almost 4 years would have very special black tants. And right at the DC input to the VIM, it has special caps there. because the input has an inductor on each of it's 4 rails, it's important to stay with the caps that are already in there. Please DO NOT CHANGE ANYTHING ON THE VIM OR NECK BOARDS!